I found some great little cookie cutters in ‘House’ the other day. I bought a little candy cane cutter to add to our collection of reindeer and Christmas trees. Thomas and I both wore our new Christmas aprons and had lots of fun! The recipe is one that I found in the latest edition of Donna Hay magazine. She had made little round cookies with chocolate stars on them so I just adapted it to suit our needs. We divided the dough into 2 different batches, one we kept vanilla and the other we added cocoa to. I like the look of the chocolate ones best. Place the butter and sugar in an electric mixer and beat for 8-10 minutes or until pale and creamy. Add the egg and vanilla and beat for a further 2-3 minutes or until combined. Add the flour and beat until a smooth dough forms. Remove 1/2 of the dough. Set aside. Add the cocoa to the mixer and beat until combined. Roll each dough portion out between 2 sheets of non-stick baking paper to 3mm thick and refrigerate for 30 minutes or until firm. Using a cutter, cut out the shapes that you desire. Place cookies on a baking tray lined with non-stick baking paper and bake for 12-13 minutes or until lightly golden. Allow to cool on wire racks. 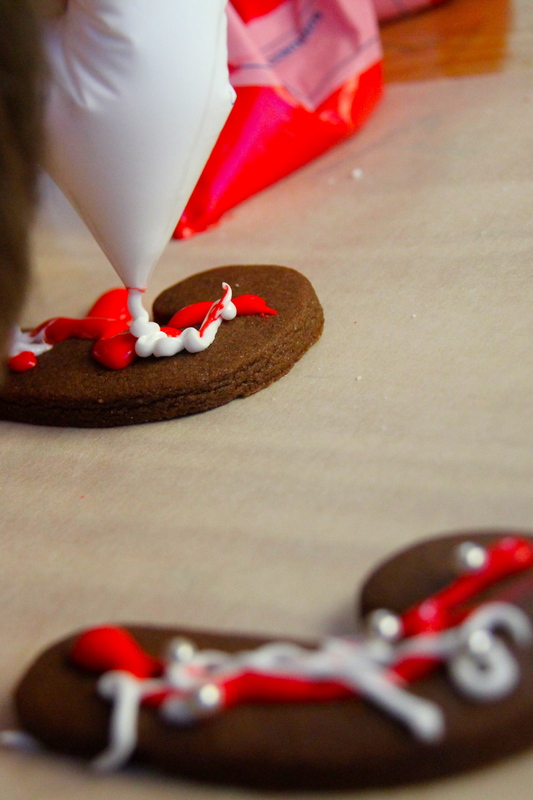 When biscuits have cooled, decorate with Royal Icing. 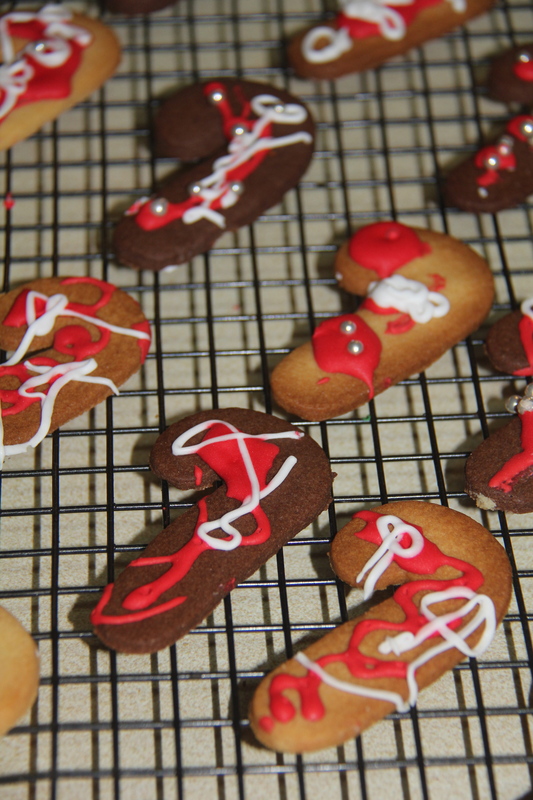 We also added some little silver cachous to some of the biscuits. Using an electric mixer, whisk egg white with the lemon juice until combined. Add food colour of your choice. Pipe onto cookies or cake. 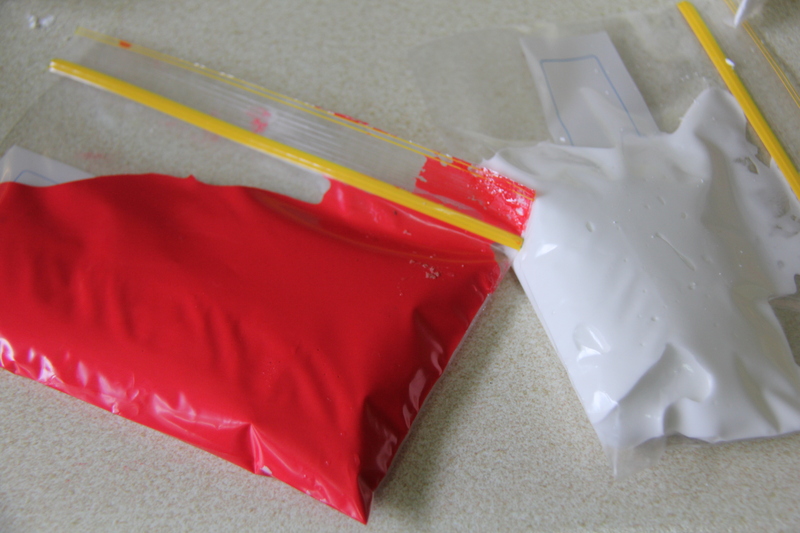 For writing icing, you can put the icing in a ziploc bag and snip the corner to create a homemade icing bag. Leave for 2-3 hours to set hard. Thomas had so much fun making these cookies. They would make a perfect little present wrapped up in some cellophane or on a plate for a Christmas party. Icing biscuits is a great activity for developing hand eye co-ordination, fine motor skills, developing hand muscles and colour recognition.